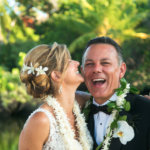 A beautiful wedding at the Fairmont Orchid in Hawaii. 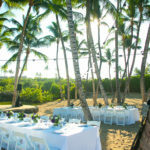 The couple were staying at the Fairmont but were married on a public beach just off the grounds of the Fairmont. There are a lot of great benefits of being married on the resort; on site spa for make up and hair, beautiful grounds, a florist, and of course an on site coordinator. Some brides, especially for smaller weddings, plan most of the details on their own which usually provides for a much less expensive wedding.